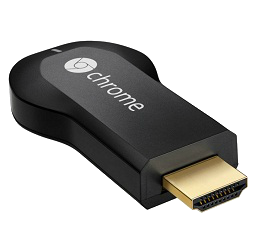 How to Rip and Stream DVD Movies to Google Chromecast HDMI Dongle? - I'd like to convert my DVD into a format that is compatible on a Chromecast dongle. What can I do before I can drag the file to the Google Chrome browser and play the movie? Chromecast, measuring 2.83 inches (72 mm), is an uprising hardware popular especially in 2014. Powered by Micro-USB, it is actually a digital media player developed by Google. It can stream audio/video contents to TV via Chromecast-enabled mobile apps and web apps, or by mirroring most content showing on Google Chrome. Till now, Chromecast is still a special existence form with peculiar format acceptance. Let's focus on ripping and casting DVD movies to Chromecast with the fast DVD to Chromecast ripper in the following text. How to Rip DVD Movies to Chromecast Video? 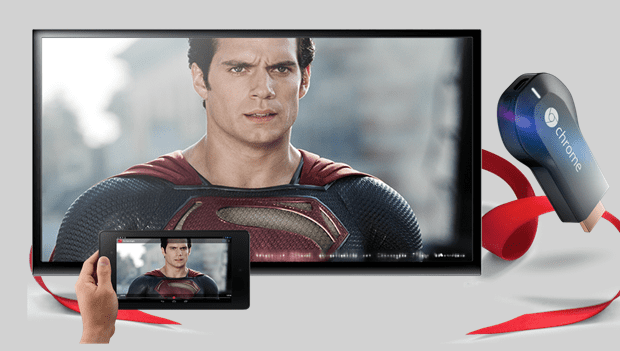 Help you easily rip DVD to Chromecast for playing movies on HDTVs. Enable you to rip DVD to MP4, AVI, iPhone 7/6S, etc. On one hand, Google Chromecast can connect to user's home network through Wi-Fi; on the other hand, it plugs into the HDMI port of a HD television or monitor. The power is supplied by connecting the device's micro-USB port to an external power supply or a USB port. How to Watch DVD Movies through Chromecast/New Chromecast 2? - I'm currently trying to get Plex to actually work with my chromecast, but it somehow refuses to cast anything. I first tried it with an mkv file, and it told me the media is currently not available. Then I used handbrake and converted the file to mp4, same result. I restarted everything a couple of times and it still gives me that result. I can't even cast the channels. I'm getting the same result there. Is there any way to fix this? I can't find anything online I haven't done already. The DVD disc or video files should be compatible with Chromecast both in formats and specifications. In order to stream DVD from computer to Chromecast, the first thing you should do is to rip/convert DVD to Chromecast with some professional DVD ripping program, such as WinX DVD Ripper Platinum (or WinX DVD Ripper for Mac). Download it or make sure you have upgraded it to the most recent version that has Google Chromecast presets. Install the DVD to Chromecast ripper out of Disk C following the Wizard, choose a language version according to your need since it is multilingualized, launch it until you see the UI, and click DVD Disc button. 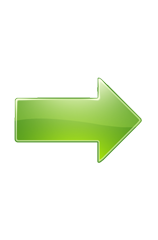 This software can also turn your ISO image or VIDEO_TS folder to a Chromecast video. 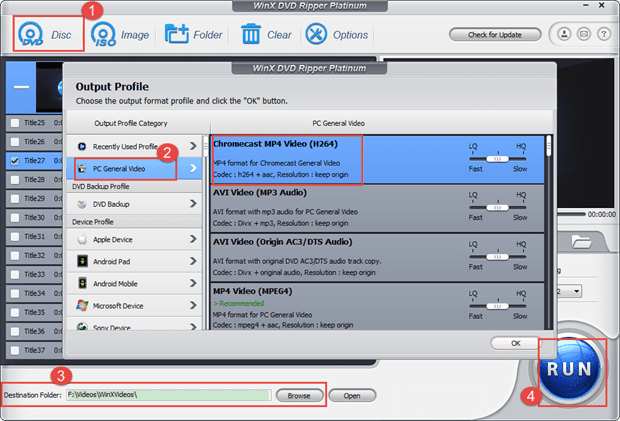 The profile of Chromecast has been included in WinX DVD Ripper Platinum V7.5.6 (and WinX DVD Ripper for Mac V4.5.3), so you can rip DVD to Chromecast directly without setting any bitrate, video resolution or frame rate: "PC General Video" under Output Profile Category -> "Chromecast MP4 Video"
To make your computer work normally, we suggest you save the output DVD movies to any Disk other than Disk C. you can set it to the disk and folder that is convenient to find and manage. Just click RUN button to start the conversion. After a few minutes, you can get a Chromecast accepted video file converted from your DVD with original video audio effect. A. You can download Chromecast mobile apps (such as AllCast, Avia and Plex) on iPhone, iPad, iPod or Android, or web apps using Google Chrome (on Windows, OS X, and Chrome OS) through an extension on your computer. These apps can help you stream DVD movies by the Chromecast to TV within a local version of the Chrome browser. B. You can choose to mirror the converted DVD content from the Chrome browser tab from your PC or Android mobile/tablet screen to TV. But this method has many disadvantages and limitations, so it is not highly recommended. * Google celebrates Chromecast anniversary with 90 days of free music: Google is luring more clients by its 99-day free Play Music All Access streaming service on the one-year anniversary of Chormecast. If you need to fast stream hot movie video from computer to any iPhone or iPad models without iTunes, please try WinX MediaTrans. How to Play Watch Movie DVD on Chromebook offline?